So, just what is mydlink™ and why is it useful? If you’ve ben looking into buying a D-Link product for your home lately, you’ll have most likely seen that it includes connection to a service called mydlink. If you’re wondering exactly what the service does and how it can benefit you then read on! You may have heard the term ‘cloud’ being talked about lately as an easy way to access your digital files from anywhere. 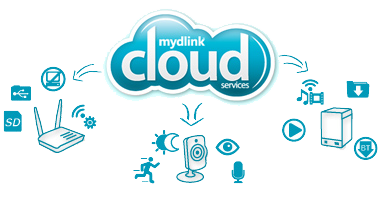 Well, mydlink allows you to create a secure personal cloud. Everything is actually stored at home but you are able to access it from anywhere – saving precious storage on your mobile devices. Most of our cameras, routers and storage boxes offer mydlink – enabling you to stay connected to the things you care about at the touch of a button. In a nutshell, mydlink is a secure website that enables you to access and control your home devices, such as routers, storage devices and IP surveillance cameras via your own personal account. You can set up your account quickly and easily and then access your home network from wherever you are. That means that you can share your holiday photos with your friends when you meet them for a coffee by accessing your home storage device remotely. Or, if you have a D-Link camera, you can keep an eye on your house while you’re away from home. You can access your entire music collection when you’re on holiday and even see who’s accessing your home Wi-Fi network by logging into your router. It even allows you to do clever things like block the kids from using the Wi-Fi when you think they should be in bed. And, with mydlink, you don’t even need a computer to access your devices at home. Just download the mydlink app to your iPhone, iPad, Android or Windows devices and you can control, access, view and share everything, wherever you may be.